Until recently caravans were not usually linked with any trappings of luxury. However that is not the case anymore with the introduction of the extravagant and expensive “Palace on Wheels” caravan in the Gulf city of Dubai. The caravan went on to fetch a whopping £2m in a record breaking sale that took place on the second week of June 2013, earning it the distinction of being the most expensive mobile home in the world. 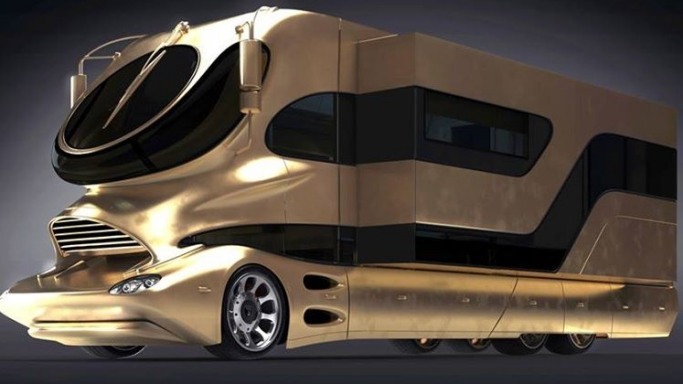 The 403 foot vehicle covered in stunning gold is also available in white color option. It comes equipped with top of the line perks like a gigantic colossal master bedroom, one 40 inch all weather proof full HD LCD TV fitted with a high end speaker system, fireplace, under floor heating and an on board cocktail bar. It even flaunts its own roof top terrace. The most stunning and impressive feature of the Palace on Wheels is the “Sky Lounge”, a contraption that magically releases with the touch of a button transforming the mobile home into a personal space with a pop up bar. The palatial look and feel of the caravan is enhanced manifold by the omnipresent magnificent marble lighting. Latest security features installed inside the designer vehicle include a real stream video surveillance system to make it easy for the user to monitor the activities outside his motor home. The modern bathroom has been fitted with a rainfall shower and has been appropriately dubbed as the “Wellness Bathroom”. The well-equipped extended living space has an integrated modular kitchen area and sophisticated gadgets like an 80 liter stainless steel refrigerator, cook top, a built in coffee machine, ice maker, a barbecue grill station, sink, oven and a dishwasher. The glamor quotient is further attenuated by the designer retractable steps lined with a red carpet emerging from the vehicle. The exuberant success of the unique and luxurious state of the art mobile homes in the tough economic environment prevailing around the world has been due to the superb response they have managed to generate among the oil rich Arab Sheiks. The ostentatious vehicle has been specifically designed to cater to the needs of the global celebrities on their world tour. The estimated cost per square feet incurred by purchasing the space ship styled caravan is equivalent to some of the U.K's multimillion designer pads. However that has not hampered the Dubai millionaires, who off late have embarked on a buying spree by lapping up the latest version of these motor homes.